Last week NOAA released their global report for April and...While North America had its coldest April since 2013, the rest of the world was downright balmy. Arctic and Antarctic sea ice cover remains small. 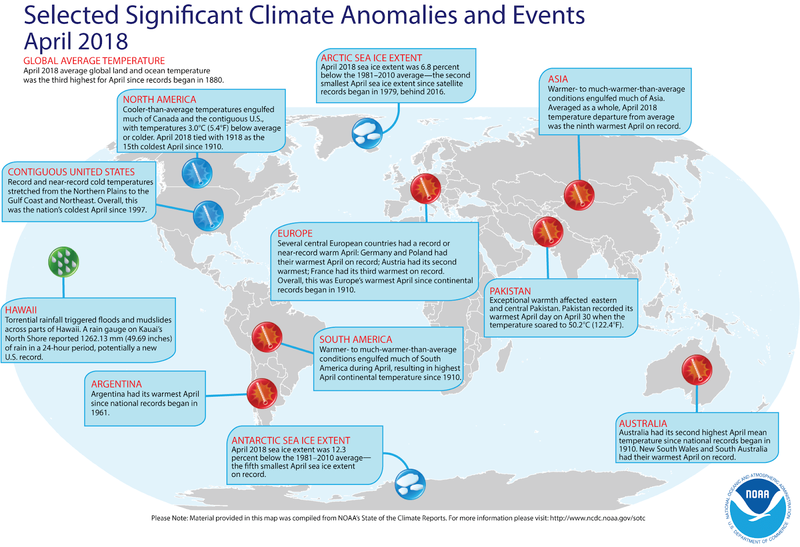 Below is a list of NOAA highlights for the weather globally in April. The average global temperature for April 2018 was 1.49 degrees F above the 20th-century average of 56.7 degrees. This was the third highest for April in the 139-year record (1880–2018). Nine of the 10 warmest Aprils have occurred since 2005. April 2018 also marks the 42nd consecutive April and the 400th consecutive month with temperatures above the 20th-century average. The year-to-date average global temperature was 1.37 degrees F above the 20th-century average of 54.8 degrees. This was the fifth warmest average temperature for the year to date on record and the coolest such period since 2014. The years 2015, 2016 and 2017 ranked among the three warmest years to date periods on record.